Dallas- NDA-HEALTH NOW-Dallas™ participated in the city’s 18thAnnual Mayor’s Back to School Fair on August 1, 2014, from 8 a.m. to 2 p.m. at the Dallas Fair Park. The event attracted 40,000 visitors. The Fair, presented by Wal-Mart and Sam’s Club, is a joint effort of the City of Dallas, Dallas area schools, public health departments, state agencies, non-profit organizations, corporations, and hundreds of volunteers. The goal is to help economically disadvantaged children start off the new school year with everything they need to be healthy, happy and productive. Funding from the W.K. Kellogg Foundation and product donations from Philips-Sonicare supported NDA-HEALTH NOW-Dallas™ participation. NDA-HEALTH NOW™ stands for “Health Equity,Access, Literacy, Technology, and Hope. National Outreach on Wheels.” The project is being piloted in Dallas, Chicago, New Orleans, and New York City. 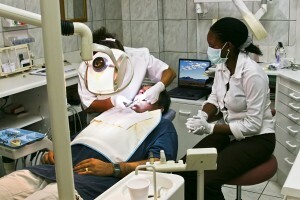 Texas A&M Baylor College of Dentistry designed and activated the“Dental Zone”, as it hasdone for many years. The Dental College provided free dental screenings and fluoride applications; and distributed children’s dental care packages, donated by Colgate, to nearly 2,000 children. Baylor dental and dental hygiene students, professors, and administrators all contributed to the effort. This year, NDA-HEALTH NOW-Dallas™ once again joined Baylor in the “Dental Zone”and provided information and donated products for the adults who accompanied the children. Dr. Jocelyn Kidd is the Dallas Project Director. Dr. Kim Perry, Associate Dean at A.T. Still University School of Dentistry and Oral Health in Missouri (the Project’s lead researcher); Dr. Hazel Harper, National Project Director (based in DC); and Jose Liens, second year dental student from Howard University College of Dentistry in DC, flew to Dallas to participate in this year’s event. NDA-HEALTH NOW- Dallas™ provided educational components to increase awareness about thelink between oral health and overall health and distributed free dental care products to 500 adults. The educational component was an adult power point presentation, the “Mouth-Body Connection” (in English and Spanish), which was developed by community health education specialist, Francyne O. Anderson, M.D. and produced by the NDA and Zayas Hendrick Mediaworks, LLC. Four hundred-sixty nine (469) participants responded to a survey designed by NDA- HEALTH NOW™, to determine basic knowledge about the connection between oral health and overall health, and other general health questions. The activities and services were free and open to the public, but free school supplies were available only to public school students in pre-K through 12th grades who live in the city of Dallas or attend a Dallas ISD school and meet the 2014 Federal Poverty Income Guidelines. A photo ID, proof of residency and proof of income were required to qualify. The fair also included free health, dental and vision screenings, immunizations and haircuts, and information on education, health and social services. There was, also, musical entertainment, kids’ activities, games, interactive demonstrations and more. The 2014 event’s major sponsors were Chase and The United Methodist Church of North Texas. Other sponsors were ActionMetals Recyclers, Aetna, Amerigroup, Baylor Scott & White Health, Children’s Medical Center Dallas, Clean Energy Fuels, Coca-Cola Refreshment Group, Dallas Mavericks Foundation, Fast Signs, Fidelity Investments, H&R Block, Half Price Books, Gene and Jerry Jones Family Charities, Methodist Health System, State Fair of Texas, Texas Instruments Inc., and TXU Energy. Other community partners for the event were: Baylor College of Dentistry-Texas A&M Health Science Center, Cedric B’s Barber and Beauty Salon, the city of Dallas, Dallas County Health and Human Services, Dallas ISD, Mayor’s Youth Fitness Initiative and Ogle School of Hair, Skin and Nails. Numerous individuals contributed to this event. For a complete listing, click here.